People do not want to work in an environment where they are or could be at risk due to another worker’s alcohol or drug abuse. While the employer has the primary responsibility of ensuring compliance with relevant OH&S Legislation, it is the duty of both the worker and the employer to comply with it. ALCOHOL AND DRUG AWARENESS ONLINE TEST: Testing conducted throughout this online Alcohol and Drug Awareness course is designed to reinforce the information presented. A mark of 80% must be achieved in order to receive a certificate of completion. Participants are able to repeat the course twice if the pass mark is not achieved. 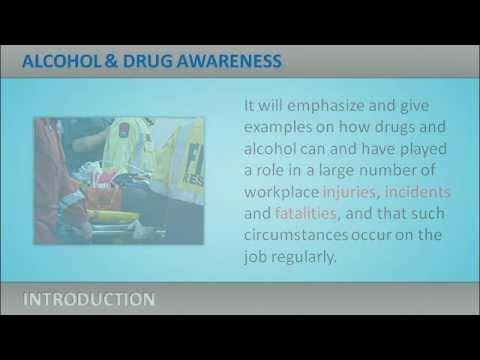 ALCOHOL AND DRUG AWARENESS ONLINE CERTIFICATE OF COMPLETION: Upon successful completion of this online course, a certificate of completion will be available for download and printing.